Bread is all well and good, but you know what's better than bread? Toasted bread. Oh yeah, buddy. And what's even better than toasted bread? Toasted bread with video game characters on it, of course. 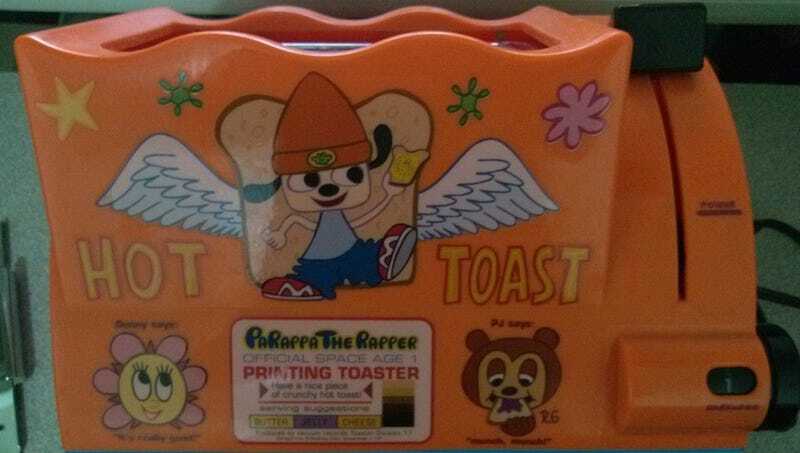 For sale is the extremely rare Parappa the Rapper Official Space Age Printing Toaster. This is a real working toaster, and is an officially licensed product. This is VERY RARE. It's missing the box and one of the printing slides. The toaster functions properly and is safe to use (however the pictures don't appear well on wheat bread). This is the only one of these I have seen for sale online in a long time. Don't miss out on this amazing collectible. What you see is what you get. So, if you've got the bucks to spare and a taste for exotic-looking toast, consider purchasing this piece of video game history. And now, here's Heywood Banks performing "Yeah Toast." Because yeah toast!